6th Largest Inland Water Port in the U.S. 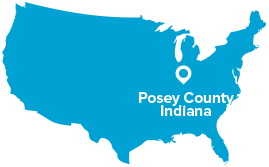 Welcome to Posey County, the Manufacturing & Transportation Hub of Southwest Indiana. Just 20 minutes west of Evansville, IN, Posey County is becoming the center for advanced manufacturing, including plastics and plastics derivatives, bio and life sciences, as well as advanced logistics and energy in Southwest Indiana. With the 6th largest inland port in the U.S., we place our emphasis on rich infrastructure, cultivating a manufacturing-driven economy and business-friendly environment, and building a workforce driven by commitment to education. As a result, we’ve built a culture that helps businesses thrive in Posey County. Follow the navigation, visit the data center, or simply contact us to see the Posey County difference for yourself. We’re less than a day’s drive from 75% of US and Canadian populations, making Southwest Indiana an ideal location for your business. Read how Southwest Indiana has benefitted these regional partners. The following companies have already seen the benefits of creating a base for their business in Posey County, and we can’t wait to welcome you, too! Read more to learn more about these companies. We're known for customizing a deal to fit a company's vision, culture and bottom line. Check out some helpful incentives. Learn how to become an investor here! We've got lots to tell you about what is going on in Southwest Indiana. Find out here. SABIC’s Innovative Plastics business is a leading, global supplier of engineering thermoplastics with an 80-year history. The business began its Mount Vernon, Indiana operations over 50 years ago, choosing Southern Indiana for its quality workforce, access to rail and water transportation, and support of manufacturing industries.